Ramblewood has a variety of accommodations to suit your needs. From cabins to camping, meeting halls and conference centers, whatever your need, we have something to meet it. There is a a selection of thirteen different cabins from which to choose. You can pick a cabin based on what you prefer. 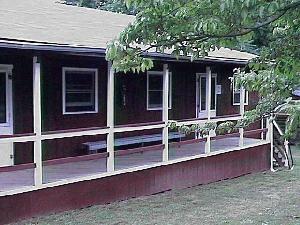 For those who like to be right in the action, there are cabins near the pools, tennis courts and meeting areas. 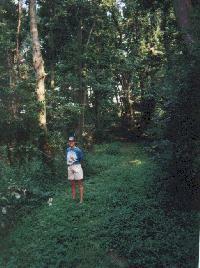 For those who prefer to get away from it all, there are cabins in slightly more secluded areas, set back in the trees. 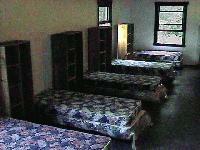 The cabins have all been renovated and contain brand new mattresses and box springs. Ramblewood's staff works hard each season making sure that the showers and bathrooms are clean, and with the help of each of the groups that stay here, we keep them that way throughout the season. One hundred sixty acres of beatiful natural woods and fields await you at Ramblewood. The open areas can accommodate thousands of campers, providing plenty of space for your group, whatever it's size, from fifty to thousands. There are no assigned campsites, so if you find a place that you like, you can put your tent down and settle in. The advantage of this is that you stay in whatever environment suits you best; a small grove, meadow, field, or back in the woods. While we allow camping almost anywhere on site, in order to ensure the safety of all present and to preserve the beauty of these natural surroundings, we must limit campfires to designated sites. The Dining Hall offers a place to enjoy your meal while talking about the day's events or discussing a group issue. A large stone fireplace at the back of the hall creates a stunning effect, giving it the feel of a Norse longhouse. Past the fireplace is another large room, complete with a big-screen TV and VCR. This room is ideal for seminars, viewing videotapes, or watching movies. This room overlooks the two swimming pools and sits above the snack bar. For giving lectures or staging outdoor performances, we offer an outdoor amphitheatre. The amphitheatre's location provides privacy from the other areas. 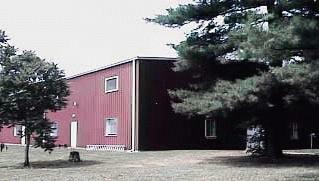 The Barn Theater, is a great place for music. Accoustics in this building are wonderful for practiving any type of instrument, and has plenty of seating for giving a performance on the raised stage. The Big Top is the largest single indoor meeting area at Ramblewood. 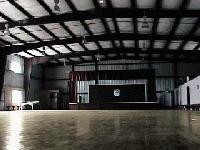 With over 10,000 square feet of sprung-wooden flooring and a raised stage, this building was designed for large dances. It makes an excellent site for large group meetings, with seating for hundreds of people. The Big Top also doubles as an indoor basketball court, and has a number of small side rooms for arts and crafts, including a complete dark room and kiln. 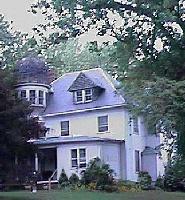 The White House is an old building dating back into the eighteen hundreds. Providing comfortable accommodations for those who like a bit of history, this building was used as part of the Underground Railroad for those escaping the slavery of the south. Although it is currently closed off, the building has a tunnel in the sub-basement used to help those escaping. Whatever your event needs, we have somewhere to satisfy it.